If you are looking to expand your outdoor environment, look to our talented Massachusetts based design team to achieve responsive and adaptive design excellence. 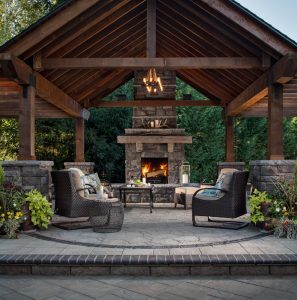 Today’s homeowners wanting to expand their outdoor living space with the addition of a fireplace, fire pit, pizza oven or outdoor kitchen island can turn to our experience to come up with ideas that will delight your senses with aromas and sound evocative of the outdoors and in the process create a unique outdoor space that is the envy of your neighbors. Contact us at 781-591-0300 or vern@ivystudioMA.com to schedule a no obligation consultation to learn how we can transform your outdoor space into something very special.